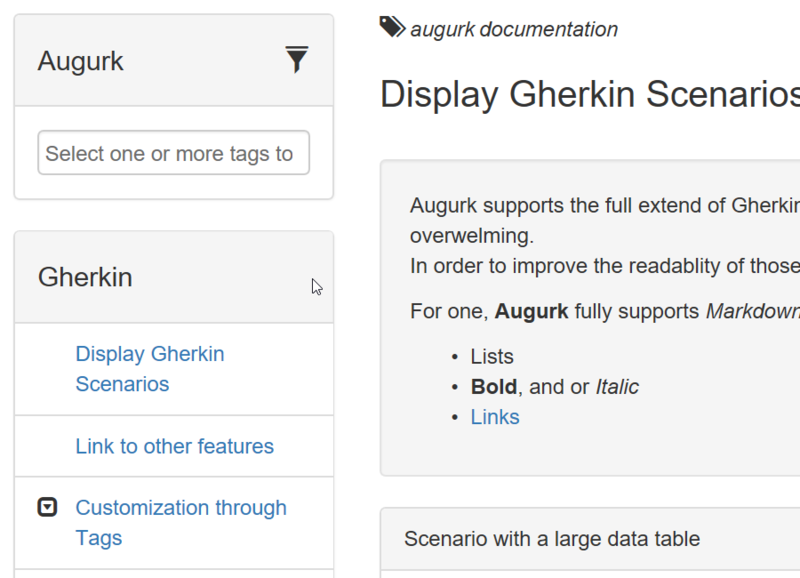 Augurk is an open-source living documentation system created especially to increase the value of your Gherkin feature files. For existing feature files, Augurk provides an accessible, easy-to-use overview of all the scenarios describing the features of your application(s). But Augurk does more than just improve the readability of features written in plain Gherkin syntax. Augurk also helps you to enrich your documentation by using features specifically designed to help you bridge the often perceived gap between specification and documentation. Augurk is greatly influenced by Relish and Pickles. 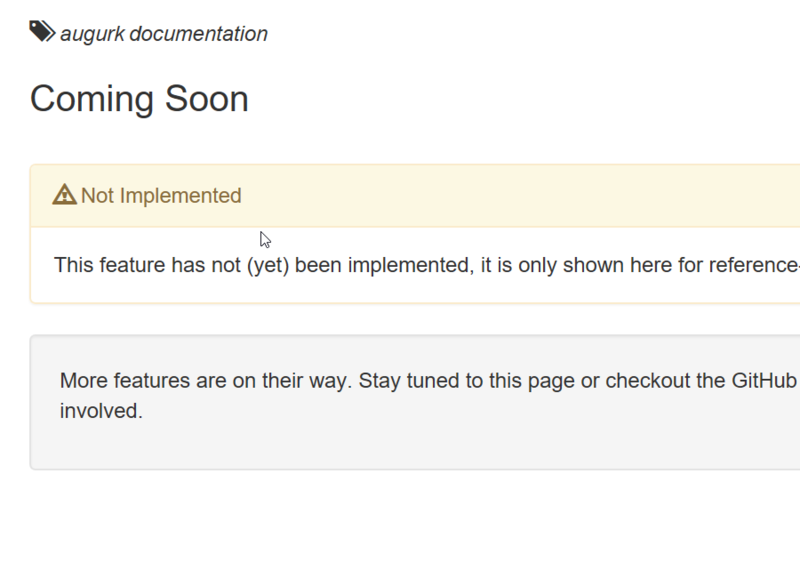 While Relish is a great SaaS application, it requires you to publish your documentation to the cloud. While this is not an issue when your sources live in the cloud as well, in other cases it is often still preferable to keep the documentation within the corporate intranet. This leaves Pickles. Although Pickles adresses the cloud issue (it was designed for that purpose), it has some short-comings of its own. Pickles generates a neat (Dynamic)HTML website for each project/solution you require it to. It does, however, not incorporate these. This means not only will you get a website for each solution, you can multiply your number of websites with the number of branches or products you maintain simultaneously. Augurk has been designed to address exactly these issues. It allows you to publish your features from multiple solutions and branches to a single location, providing you with a single access-point for all your documentation. While Augurk is based upon the same principles as Pickles, it has been rebuild completely from the ground-up, allowing Augurk to provide all the same functionality but simultaneously improving and extending it where necessary. 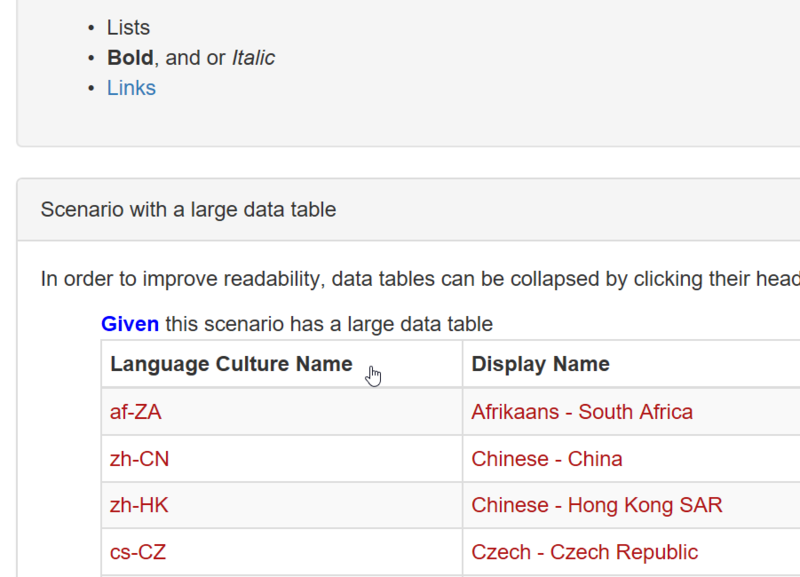 To make long feature files with large tables a bit more easier to read Augurk allows you to collapse large tables so you can stay focused on the functionality. 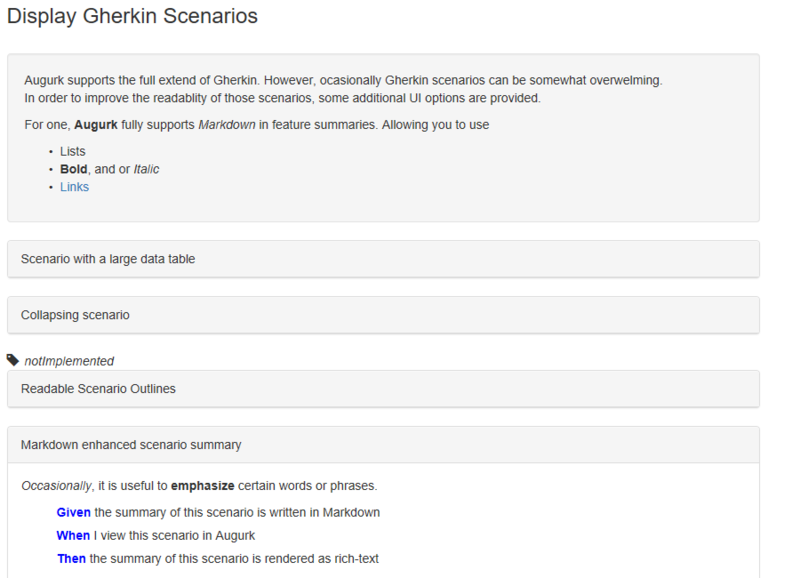 You can even collapse entire scenarios so that you can focus on the most important ones. 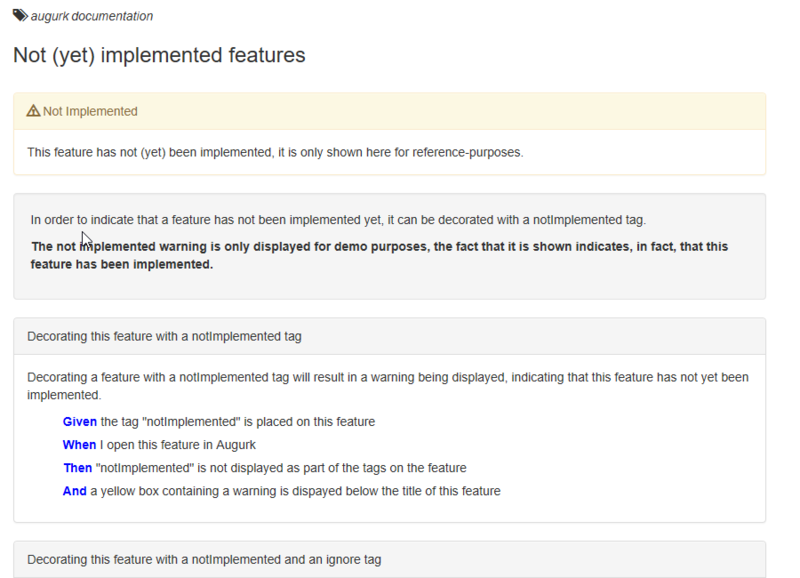 Need a bit more than just flat text for your documentation? 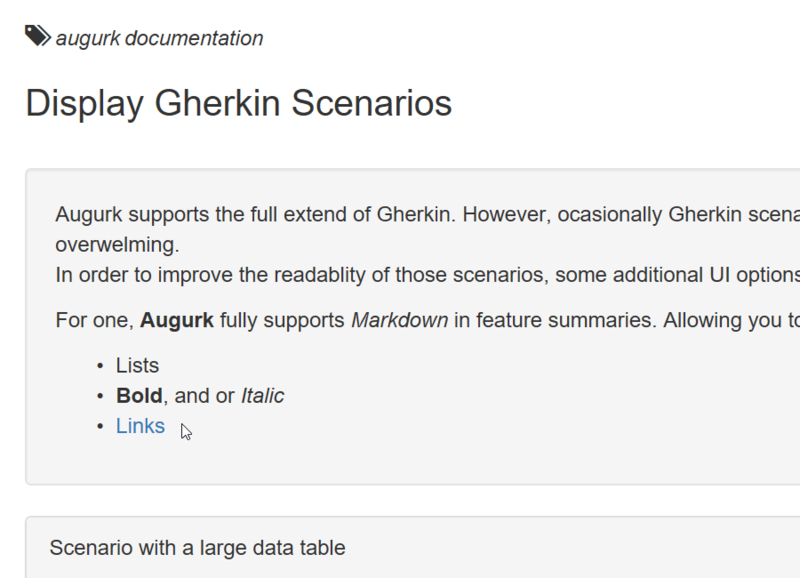 No problem, Augurk supports Markdown for feature and scenario descriptions so you can do things like bold and italic text. You can even add images for additional understanding. When publishing all your feature files to a single location, things tend to get quite messy. Augurk helps you to prevent this by allowing you to organise your features into products and groups. In addition, it supports (semantic) versioning so you can view different versions of a particular feature all in one central location. Still working on a particular feature, but it has not yet been fully implemented? 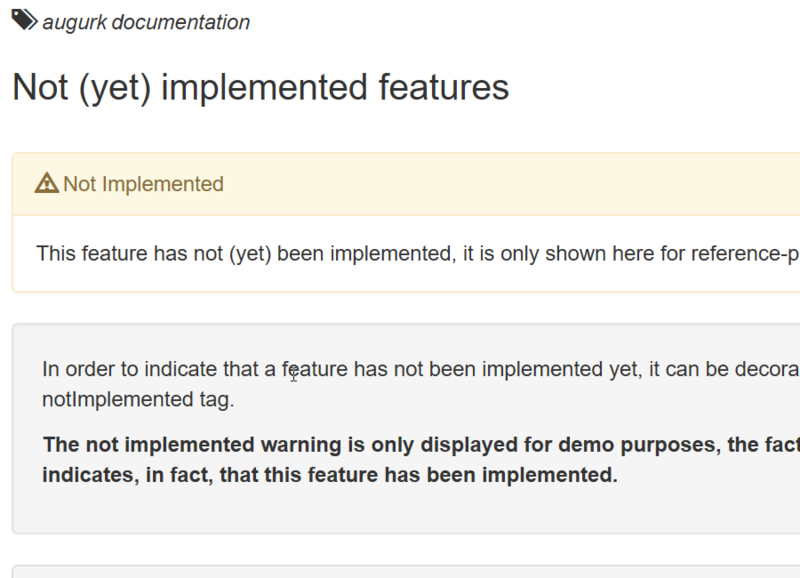 Put a @notImplemented tag on it and Augurk will display a warning to readers that the feature has not yet been fully implemented, instead of the error that will be displayed when you only use the ignore tag. 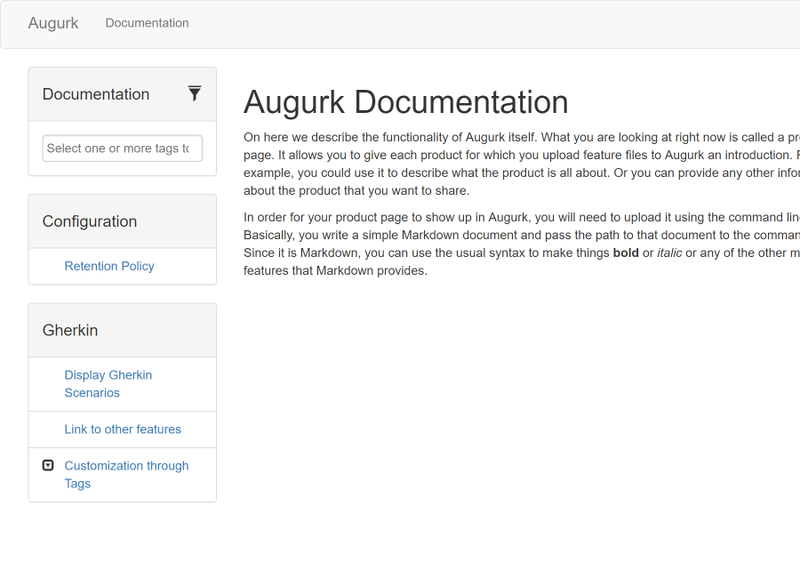 Augurk also has support for creating introduction pages for the various products for which you upload feature files. This allows for the creation of a custom landing page for your products as well as an entry-point for discovering the features of that product. We are currently ramping up development of Augurk. 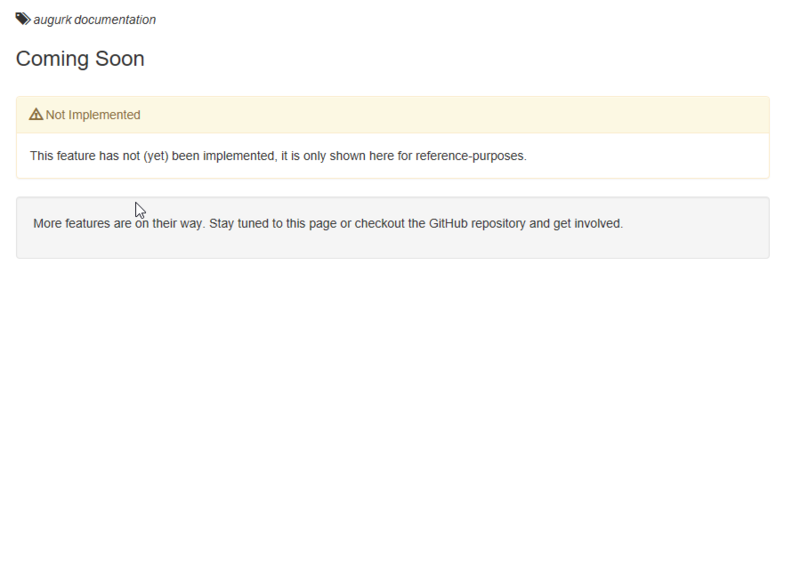 Keep an eye on this page and our releases page on GitHub. Or get involved. It's open source after all!